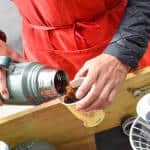 Mariano Marinoni, 34, has created a unique addition to San José’s coffee market. 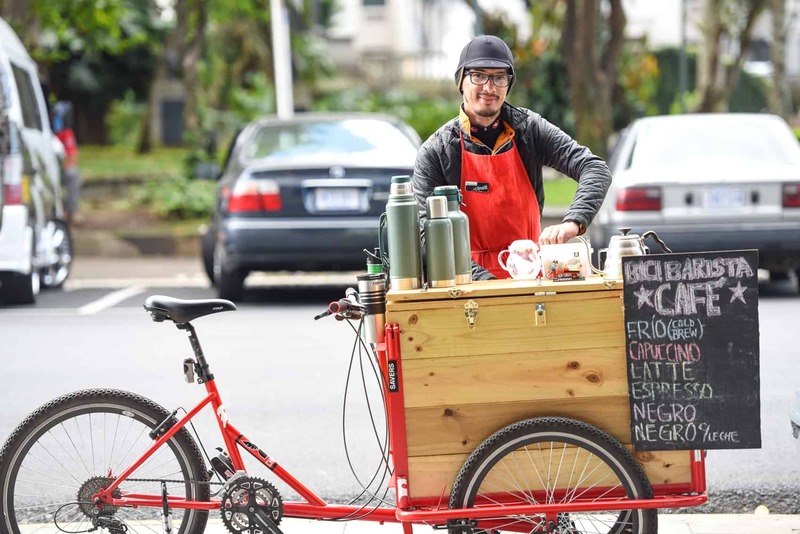 His Bici Barista Café gives “coffee to go” new meaning: it’s on wheels. 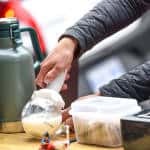 Marinoni rides his bike, which is also his shop, from San Francisco de Dos Ríos to the center of San José — approximately 6 kilometers — every morning to offer his brew to National Insurance Institute (INS) employees and passersby near Parque España. Marinoni launched his project on Nov. 22, 2015, and has attracted a group of loyal customers. He uses Costa Rican coffee from Rio Jarco Farm, in Aserrí, which he says is “first class” coffee. He plans to begin using organic coffee as well. 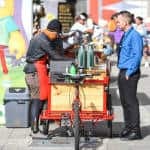 His bike, which emulates the Dutch Cargo Bike model, has a big wooden box where he carries and prepares his coffee, Monday through Friday, 6 a.m. to 10 a.m. most of the time. He sells approximately 100 coffees per week. This idea came when Marinoni, after being fired from a call center, started working for free at a coffee shop. 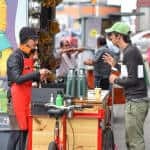 A girl who works there told him she had an idea to create a coffee shop on a bike, but that she had a few strikes against her: she didn’t have a bike or know anything about them, so she would have to buy one and then pay another person to ride it to the center of San José and to sell the coffee. For her, it was a tall order, but for Marinoni, it was perfect. 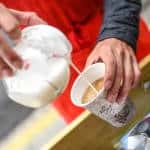 He had taken a barista course in the United States; he lived in Portland, Oregon for four years, the city of bikes and coffee shops, and worked in a few shops. He is also a bicycle mechanic, something he became particularly interested in while living in Portland. 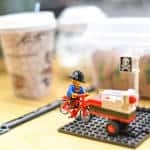 A bike similar to his would cost approximately $2,500, plus taxes, he said, but he built his with an investment of $1,000 — money he has already recovered from his coffee sales. Marinoni is also the creator of the project “Yo Cleteo San José,” which he launched after his return from Portland, and which encourages people to bike rather than drive or take the bus (too slow, he says of the latter). He fixes and restores bikes, then sells them at low cost, offering different payment methods so people can acquire them more easily. Marinoni is now looking for ways to create new opportunities for biking street vendors. It’s an uphill battle since these businesses are not legal, and the municipality can confiscate their equipment and goods. Marinoni’s idea is to present a proposal to the Municipality of San José for quick food handling courses for biking street vendors. That way, vendors would handle their products hygienically and have the the support of the government. He also discussed his project with the mayor of Montes de Oca, Fernando Trejos Ballestero. 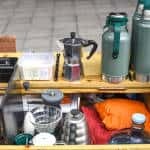 Marinoni says that Trejos attempted to reform that municipality’s code on street vendors, but did not receive the support he needed from the Citizen Action Party (PAC). According to Marinoni, who belongs to the Frente Amplio party, if he continues to strike out with municipal leaders, he might file a complaint before Costa Rica’s Constitutional Court, or Sala IV. He is also running for district representative in San Francisco de Dos Ríos in the upcoming February 7 elections. 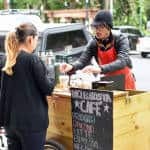 No matter what, however, Marinoni feels he has found his calling and is ecstatic about the progress of his mobile café.